Bakson's Sunny Herbals Papaya Pack Nourish skin, Clean skin, Tightens skin pores, Improves complexion by removing blemishes & pigmentation marks. Removing blemishes and pigmentation marks. Great skin firming and anti ageing agent. with Aloevera, Papaya & Jojoba Oil. 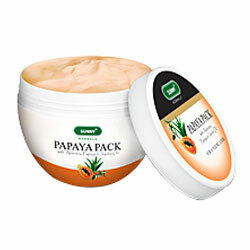 Papaya is a great skin firming and anti ageing agent. Enriched with the goodness of Aloevera and Jojoba, Papaya pack nourishes the skin, cleanses it, tightens the pores and improves complexion by removing blemishes and pigmentation marks. Wash face and pat it dry. Apply a generous amount of Papaya pack on face and neck, leaving the area around eyes. Rinse face after 15 mins. with fresh water.